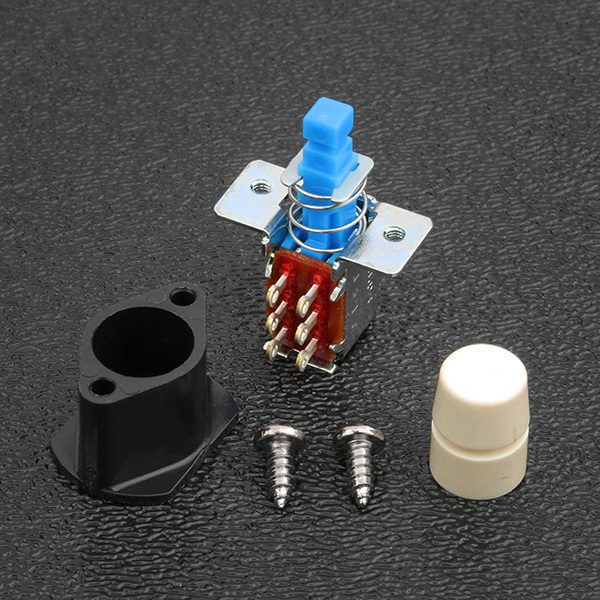 Genuine Fender® DPDT push-push button switch kit as installed in the Deluxe Player, Jeff Beck, American Elite Strat® and various other models that use this push button switching method. This switch kit we offer consists of all genuine Fender® parts depicted on the right. If you do not have the original pickguard for this switch, your pickguard will require a 11/32" hole drilled in the correct location to accept the button switch tip. The black switch mounting block is attached to the back side of the pickguard with a strong glue such as Devcon 22045. INSTALLERS NOTE - MUST READ: The mounting tabs on these switches are threaded for metric M2 x 0.4 machine screws which is not how Fender mounts these switches on their mounting block. Fender uses a #3 x 1/4" sheet metal screw to fasten these switches to the switch mounting block so some modification / drilling of the two mounting holes in these switches are required for installation.